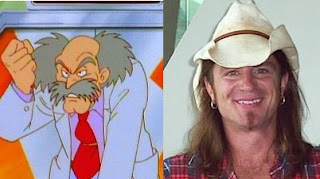 Scott McNeil, the "man of 1,000 voices", will make a guest appearance at Metrocon 2009. For those who don't recognize the name, Mr. McNeil is a voice widely heard in three different Mega Man cartoons, including Dr. Wily and Proto Man in the 1995 Ruby Spears cartoon, Dr. Wily in the Upon A Star OVA, and Guts Man in Mega Man NT Warrior. The event takes place in Tampa, Florida from June 19th to the 21st. More details can be found at the official Metrocon website. he´s such a bizarre dude!! Perhaps, but he's a funny guy, and there are some awesome interviews of him (I know they are attached as links to Wikipedia, so they ought to be up on YouTube) - certainly worth a look sometime. I live in Wildwood Florida which isn't too far at all from Tampa. I so wish I had a sealed Protoman figure from the Bandai toy line. Getting him to sign that would make my day, no...many days, lol. He is quite a remarkable voice actor and without a doubt one of my favorites. Perhaps I shall get a pic with the legend and post it or something. Just gotta get his sig on something, I guess my DVD sets will suffice. Volume 2 with Proto on it would work eh? I saw him at the Calgary comic book expo last year. Oddly enough he looked the exact same as in the pic on the main page. It's odd for someone to look like themselves? Maybe that's where the pic is from.